The Alpine Bicycle Club, home of the Colorado Rough Riders is dedicated to mixed terrain touring. Touring through the alpine environment here in the Rocky Mountain West requires efficient travel on any surface from paved road to single track. All on the same route, with the same bike. Mixed terrain touring or "Rough Riding" has a rich history in the American West. 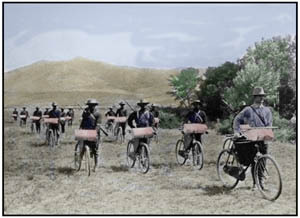 The U.S. Army experimented using bicycles on long trips through roadless mountain areas. Buffalo Soldiers rode hundreds of miles on heavily loaded bicycles, but managed to out pace horse mounted calvary soldiers. Today we don't advocate riding off trail, but the versatility and efficiency of bicycle travel has endured. Mixed terrain travel has begun to blossom again spurred by a fusion between mountain and road bike technology. Today mixed terrain touring spans a wide variety of activities from alpine travel in the Rocky Mountains to adventure travel across undeveloped countries and even snow riding. Most bicycle makers today are niche oriented. While the typical mountain bike is designed for technical single track, they are sluggish on pavement. Road bikes are impossible on dirt or gravel. But a few bikes are designed to be equally efficient on any surface. These bikes, called all-rounders, are ideal for mixed terrain touring & Mountain+Cross. Colorado Rough Riders are constantly experimenting with new all-rounder bike builds and converting old mountain bikes into all-rounder functionality. Please email us any insights you may have from experience with your own all-rounder builds. We also love photos of all-rounder bikes so get out your digital camera. Sure you can tour in the mountains fully loaded. But it's not easy or efficient hauling heavy loads up steep mountain passes. Mixed terrain cycle-touring demands an alternative approach called ultralight touring. Hey we'd even credit card tour if we could. So light is right. Unfortunately there aren't always towns conveniently situated in the back country. Ultralight touring borrows heavily from backpacking and mountaineering. With ultralight cycle-touring however, one must look at the whole system including rider, bike and gear. Shaving weight off all three is important. Some weights savings however are better than others. Please send us your thoughts on ultralight touring. We are always looking for new and unique ways to save weight. Check out the Rough Riders if you live or travel to California. "Any Bike, Anywhere" is their riding philosophy. We think of ourselves as the Colorado Chapter of the Rough Riders. Located in Britain and started in 1955, this may be the oldest club dedicated to mixed terrain cycle-touring. The Adventure Cycling Association mapped the Great Divide Trail, the worlds longest off pavement route. And it passes near us here in Golden. There's also a race. The site to visit if you like bike camping. Great resource for bike setups, route descriptions and gear reviews. Denali Dirt Road Randonnee is an interesting ride sponsored by the Alaska Randonneurs. This event is a fundraiser event for the Franklin Land Trust. The event is in Historic Deerfield Massachusetts. The Iditarod Trail Invitational is the world's longest winter ultra race across frozen Alaska.